Lush Fab Glam Inspired Lifestyle For The Modern Woman: Hollywood's Leading Men Take Over The Cover of Vanity Fair Magazine! Hollywood's Leading Men Take Over The Cover of Vanity Fair Magazine! 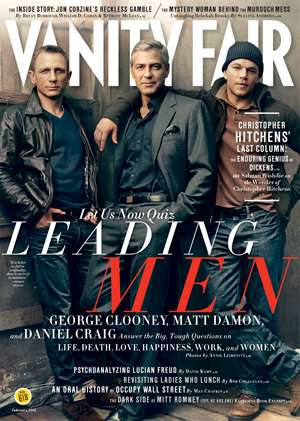 ﻿Hollywood's most eligible bachelor George Clooney joined enviable hunk Daniel Craig and Leading actor Matt Damon on the cover of Vanity Fair's February 2012 issue. For photos and more from the issue titled 'Three Kings and A Questionnaire' check out the issue when it hits newsstands later this month. Which actor is your favorite? Leave a comment below. George and Daniel look good Matt not so much. Why is matt wearing kills the pic. George Clooney is as good as it gets.